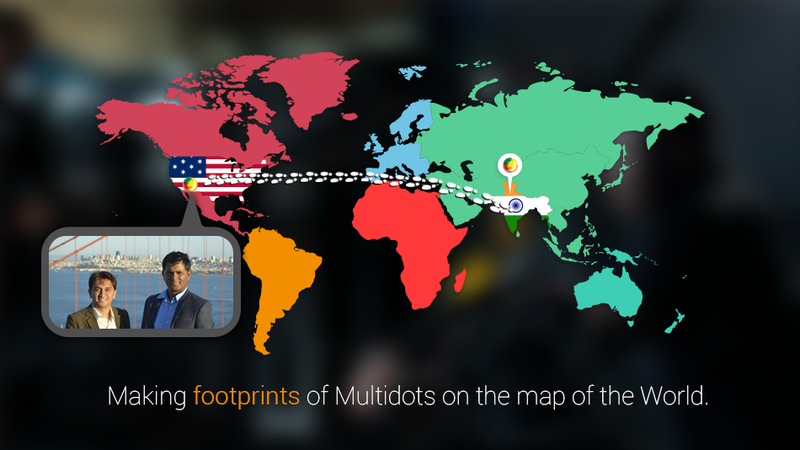 Since last 5 and half years, Multidots has been the reliable development partner for our global clients. We have clients working with us since many good years from around the world. But it took a lot of time for us to visit and meet them in person. We strongly believe that two business and their people working with each other should really spend some time together, learn, experience and exchange the cultural values and thoughts, understand the emotions and thoughts of their people, customer and other associates. Being in service space, it’s always been a huge important to understand the customer and their emotions right. Business can’t only run with machine it has the people and their emotions involved as well. Our CEO – Anil Gupta and CTO – Aslam Multani holds this nice thought since long and presented a dream to make this happen in one of the effective way at the time of celebrating 5th Anniversary. Therefore, they took a decision to start a journey to go and visit at our customer’s place and country to spend some time with them, understand their business, their culture, customer and country. United States of America was the obvious choice to start with as huge percentage of our clients are from America. And coming months we will go to few more countries to meet our clients there. We had planned for a 20 day trip to USA. Anil and Aslam landed on San Francisco city on 14th Oct and stayed there for 13 days, then we stayed in New York for 6 days and in Washington DC for 1 day. We met all the client of Multidots for whom it was possible. Our experience was truly amazing meeting client, their team, understanding their business, customer and on top of the business and profession relationship we would have spend a good personal (not professional) time together. Sharing the ideas, feedbacks, cultural differences, global and local thoughts, strength and weakness, future, all was precisely very effective for us and our clients. We learned and got inspired in many ways by meeting our clients, experiencing the cultures and values and thought of the people. We also attended WordPress Camp – WORDCAMP SF 2014. We wanted to make sure it become business and LEARNING trip. Therefore, we participated in this camp and sponsored it support this camp and community for the good cause. We have attended almost all the learning sessions from the global speakers out there with motivation to apply those learnings of WordPress on our client’s project and can train our team to become more competent and expert in this field. Multidots is proud and leading solution and services provider to our global clients for their online web presences and web apps development. Hence, it falls in our prime interest to participate, promote and support WordPress Community and Initiatives. Further to this interest, Multidots team has also started to contribute in the core WordPress development. Though, it’s just a very small beginning and contribution and there is certainly a long way to go but we make every moment a motivation for us to do more and more. It was great business trip and experience for Multidots and we would like to thank all our clients in U.S.A for their time and support to make the meetings comfortable and effective also special thanks to again them for hosting on lunch and dinner for delicious food. We would like to offer our big thanks to our friends and well wishers out their for the great hospitality and offering the conveniences during our trip. We look forward to meet and visit again to our clients and wonderful people of America!